Easy to place, offered SS Liquid Storage Drum is finely tested by experts on numerous patterns. This storage drum is superior in quality and durable in nature. Capacity: 25 ltrs., 50 ltrs., 100 ltrs., 150 ltrs., and 200 ltrs. 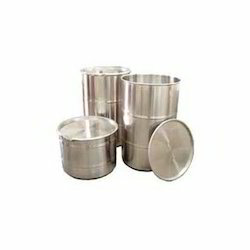 We keep ready stock of best quality tanki/ pawali useful for storage foodgrains/ liquid e. T. C. Capacity from 10 ltrs. To 500 ltrs. We specialize in design and manufacture of stainless steel drum ideal for application in pharmaceutical, food, cosmetic and other industries. These drums are provided with discharge valve, solid SS end plates, 'U' shaped trough, and SS shaft with specially designed paddles. Sturdy in construction, our drums are used for mixing dry or dump material and for tablet granulation. - M.O.C. S.S. 304 / 316 / 316 L Quality. 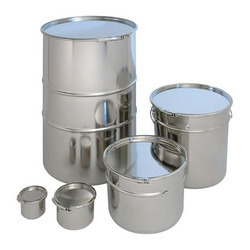 Owing to the efforts of our skilled professionals, we have been constantly engaged in offering a qualitative assortment of Stainless Steel Drums. We are engaged in offering S. S. Drums for our valuable clients. It is ideal for application in pharmaceutical, food, cosmetic and other industries. It is superior performance in corrosion resistance, tensile strength and re-usability. It is offered by us are known for durability, reliability and leakage proof construction.